Im Yoon-ah (Hangul: 임윤아; born May 30, 1990), better known by the mononym Yoona, is a South Korean singer and actress. 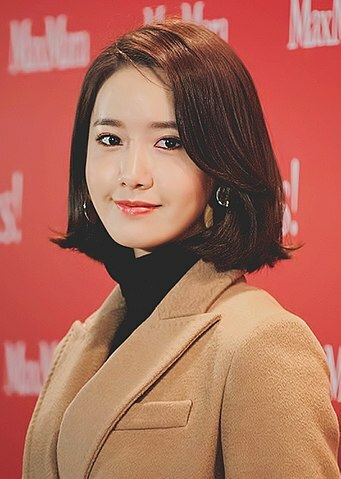 She debuted as a member of girl group Girls' Generation in August 2007, who went on to become one of the best-selling artists in South Korea and one of South Korea's most popular girl groups worldwide. Apart from her group's activities, Yoona has participated in various television dramas, notably You Are My Destiny (2008), marking her career breakthrough, Love Rain (2012), Prime Minister and I (2013), The K2 (2016) and The King in Love (2017). A love story between a surgeon and a flight attendant couple with many problems that surrounds their relationship. "When someone loves you, you shouldn't take it for granted because you will end up getting hurt due to your stupidity and ignorance thinking that they will always be there and once they're gone you will realize your mistakes and chase them and fight. Fight for their love. And that was the mistake that I have done when I took him for granted and I still love him up to this day and I am still fighting for him as he did for me before he gave up. ONE-SHOT STORY for Yoonaddicts out there. Who's there for every Yoona's pairings. A beastly, cold hearted warrior who won't let anyone else into his heart except his late wife. A mischievous and cheerful girl who fell for him at the first sight. How will they end up if they were forced to marry and live together? Characters Kyuhyun, Donghae, Yoona, Seohyun, SNSD, Super Junior and others characters. Did you believed that brother-sister relationship will be last longer if it come from two person that didn’t have any related blood? I doubt it. There’s possessiveness, care, desire and the worst of all is LOVE. You can’t resist love.